Yesterday marked the end of the first week for January 2013 and I saw it out with the 3rd ride of the year as well as the month! On the 4th, I’d planned to take a little rest, staggering my rides to roughly every other day or so until I’ve built up a little more before trying for consecutive days in preparation for tours. The weather had other plans for me. Between 8 am and 8:30 am, it was finally light enough for me to make out that the seemingly gray skies were actually that deep pewter shade of pre-dawn clarity. A sunny day? Truly!? I knew if my eyes did not deceive me, then I’d be out the door and pedaling more miles. It was true and clouds didn’t maliciously roll in to spoil my anticipation as I waited for more sun. I knew I was going to do more than the River Loop. The sun finally crept high enough to kiss the tops of trees and buildings with that beautiful orange-y light of a new day. 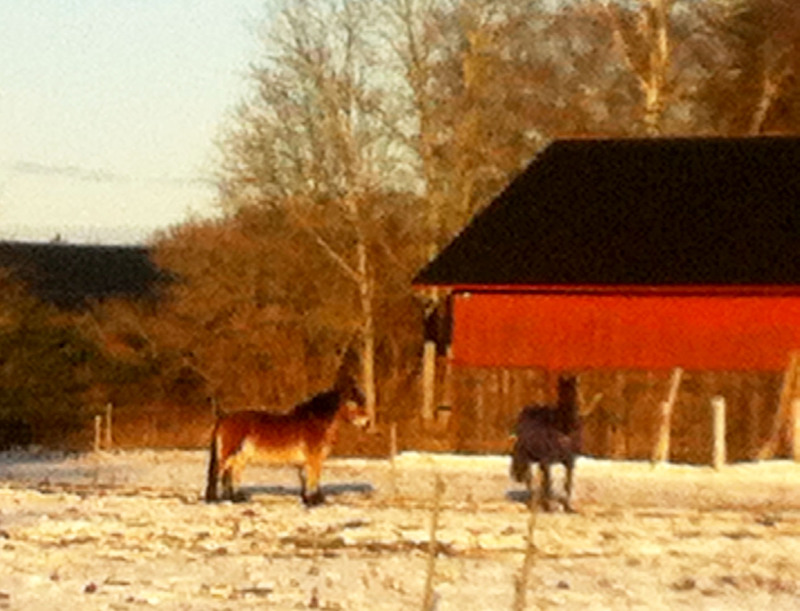 For a Swedish January, it was quite warm, hovering around 39 F (3.8 C) with a bit of a breeze. Loke had his usual yodeling enthusiasm as I pulled on my mittens and started the GPS. Off we went as if blasted from a cannon, Loke pulling for all he was worth until we whipped around the first left turn to go through the ‘back’ residential area. Though many streets are clear, those tiny little lanes with barely enough room for 1 car to pass by the ones parked at the edge still had a dense covering of packed snow and ice. It slowed us down, jarring my teeth as I struggled to keep us from dropping into a crawl. 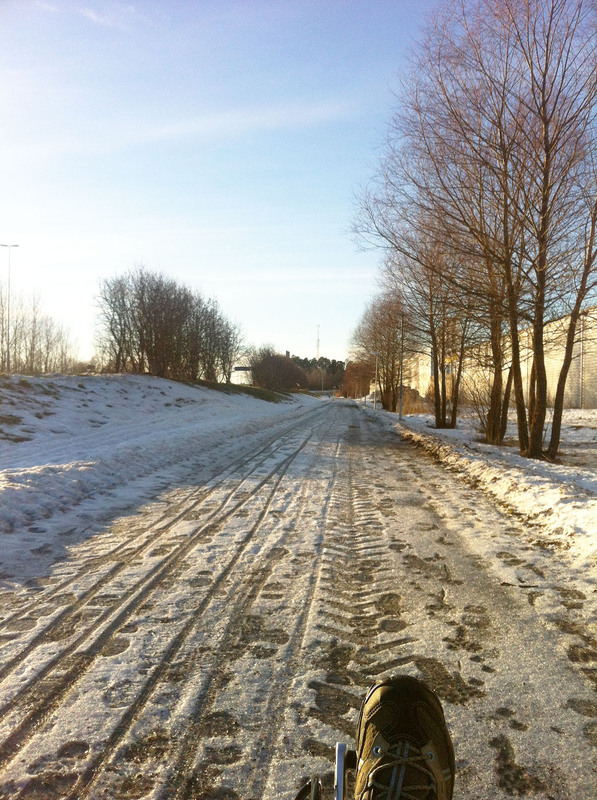 By the time we turned by the school and reached the cycle paths, Loke had settled. His pace was good, but he didn’t seem interested in going faster than I pedaled. No pulling. He was going to make me work for it. I couldn’t blame him if his lack of enthusiasm was from boredom. The first 4 miles or so were going to be the same as we’d ridden the day before. I supposed I could have tried telling him we weren’t going to be doing the Ströbylund/Läby/Maxi Loop, but I’m not sure he’d have believed me. The Ulva/Gamla Uppsala route is about 2 miles longer than the one heading through Ströbylund at around 14 miles if I went through the residential neighborhoods off the main road there which I find a little more enjoyable. I wasn’t in a hurry with a pretty day. Indeed, I wanted as much time under those blue skies as our collective six legs would allow. We climbed the steep little hill right at the junction of Gamla Börjevägen and the 272 where I closed my eyes briefly to sigh at the sun falling gently upon us. 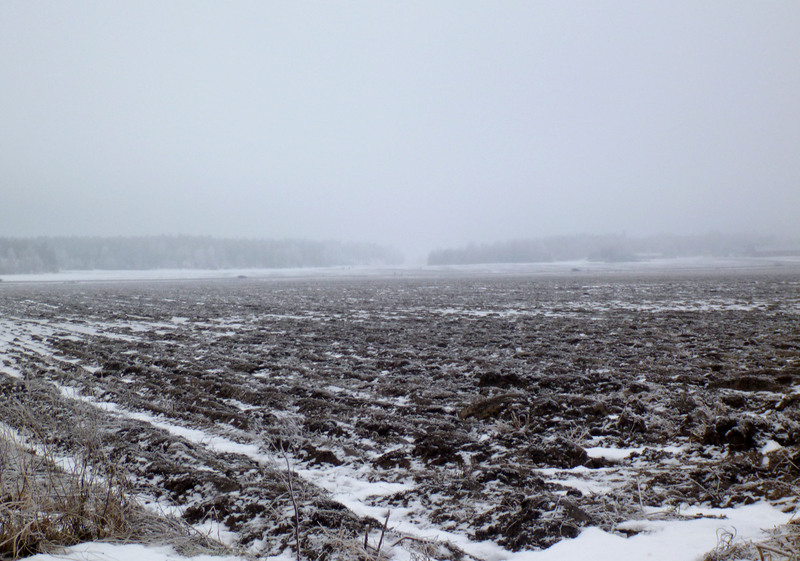 For nearly 2 miles, the southern side of the road was flanked by fields. No shadows to block that glorious light we’ve seen so little of in the past 9 months except for thin slivers of power poles. But for the jingling of the tether’s clip against Loke’s harness ring because he wasn’t pulling, the day was near silent. The occasional throaty croak of crows was the nearest thing to bird song. It made me long for the meadow larks that will be here in a couple months. I just love the light at this time of year. Near perfect for photos all day! We finally reached the crossroads. Left was the 12-ish mile of the Ströbylund Loop. Straight would take us on the Börje/Gamla Uppsala 18-ish mile meandering. Right was of course, the roughly 14 mile Ulva/Gamla Uppsala route. As we made the right turn, Loke perked up some. Our speed wasn’t much more than 4 or 5 mph with that long, but not terribly steep hill to climb, but he raised his head and took more interest in the surroundings. 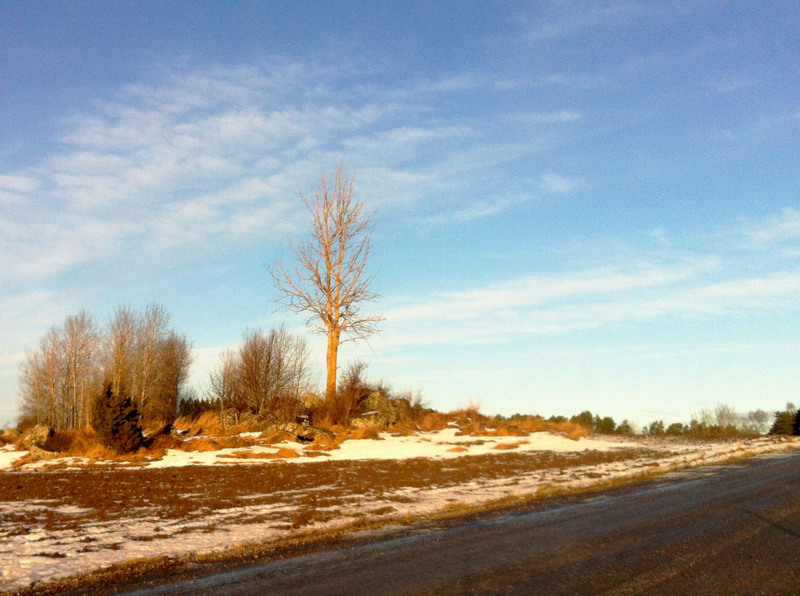 I stopped once to take a picture of a winter-bare tree growing from a pile of rocks at the edge of the field. The red-gold tint of the low sun against the limbs and rocks was just too much to resist. That was when I discovered, I’d forgotten the camera’s memory card. I’d left it in my computer from when I’d taken photos off it for the previous post. My carelessness irritated me, but I grudgingly pulled out my iPhone. Better than nothing… I suppose. We crested the slope and Loke turned into a machine. He didn’t pull enough to do more than silence the jingle, but he moved quicker. The little road linking Gamla Börjevägen to the 272 through Broby has a slight downgrade and the 5-8 mph winds were at our back allowed me to push the trike faster. I probably could have hit maximum speed, but Loke seemed content with a rapid 9.2 mph clip. It’s a speed that hovers on the edge of becoming a lope, but he didn’t seem to want to leave the leg-blurring trot. It’s rather like watching racing sulky horses when he runs like that. The last stretch to the curve past a pasture and barns through Broby itself is more of a downhill and Loke finally broke 10 mph, stretching himself a bit. A pair of horses watched us as we rounded the turn. Neither of them were frightened, but not curious enough to come see us. One of them was an adorable draft type horse of a smaller type. I stopped to snap a photo with the iPhone and watched them for a minute or two. The next few miles of the ride went by fairly brisk. Loke had a content doggie smile as he ticked along. The sun was lovely and the winds not too cruel. I’d even removed my mittens to return them to pod-bags. The quarter to half mile along the old E4 was unpleasant. Granted, it’s never a fun stretch, but with a 2 foot high wall of dirty, almost black snow crowding the shoulder and passing cars tossing up gray water, it was more irritating than in the spring and summer. The last mile or so slowed down though. I think Loke’s feet were a bit bruised from jogging along on gravel. Even where the roads had melted clear, the gravel remains of course. On the paths, there’s plenty of it to give grip on the ice. I probably should have brought booties for the furry one, but my few attempts to sock him during the December outings offered more problems then they solved. Every stretch of ice, unless it was rotten or very heavily sanded, the socks made him slip more. The reinforcing tape gave little purchase and without his claws to dig in like cleats, his paws wanted to go every which way. The roads and paths on the 4th were probably clear or graveled enough he’d have been fine. Hindsight. The last quarter mile or so, he started to walk carefully. Naturally, his paws received a careful examination when we reached home. He didn’t mind me handling them and, on smooth surfaces, he was bouncy with plenty energy even after covering 14.32 miles. Once I’d seen the trike back inside and Loke watered, fed and out of his harness, I nervously plugged my Garmin into the computer. I made sure to make note of the distance before doing so. I was nearly giddy with relief when it worked just fine. No message to declare it needed reformatting and wiping the trip’s mileage before it uploaded to the software. Jens had fixed it! I don’t intend to let down my guard with it. I also decided to see how many miles I needed to beat last January’s total. To my delight, I already had! With all the problems with Loke’s impacted glands and infections on his feet in January 2012, we did very few miles indeed. Just 24.5 miles roughly in only 3 rides. Upon finishing the sunny day’s ride on the 4th, we’d ticked over 26.68 miles and with time left in the first week of the month! Not to mention we’d done it in only 2 rides. January 5th was also a sunny day. Despite my initial resolve to take advantage of every clear moment, my legs felt weak. Add in the fact I wouldn’t have taken Loke with me even if I had pushed out the door, I ended up resting. I think it did both of us good. Loke didn’t even bug me about it though he was cheerful and energetic while on his morning walk with my husband. The gray was back on the 6th. I spend the day feeling too sleepy, almost zombie-like, to summon the ‘oomph’ to go ride. I did drag my groggy self to the gym though! The first time since before December 28th and the ‘break 800 for 2012’ riding frenzy. I mostly worked my arms since the only exercise they see with the trike is lugging it out the door. My legs have had plenty of workout the past couple weeks. The same constant-yawning, barely-conscious state continued yesterday as well. Yet a nagging little voice in the back of my head wouldn’t just let me doze through the day in between small house-hold chores. I really don’t want to turn around and wonder where the rest of January disappeared to and left me with a measly 26.68 miles. Around 1 pm, that little voice was joined by Loke’s not so subtle announcement that the time for another ride was past due. He stood at my chair side, staring at me with wide-eyed intensity and slowly swinging his tail from side to side as if to hypnotize me. I could feel the husky equivalent of the Jedi Mind Trick working into my brain. ‘You will take my toy outside’ it said over and over again. My own conscience hadn’t been enough to move me, but Loke’s ‘nagging’ was extra impetus. My jaws gaping widely in yet another huge yawn, I started staggering around for wool thermals and GPS. It was gray and technically above freezing. 32.4 F. I began to have doubts about the ride, not because of the weather, but the annoying sharp pain that jolted through my right knee as I took the trike down the stairs. I’d considered riding the Vaksala/Granby loop for 10 miles, or 13 if I could stand the idea of the 2 mile stretch of field tedium, but with Loke not pulling, I guessed it would be a short ride. 3 miles, tops. I wasn’t going to be so cruel as to not go though. My furry personal-trainer would likely have dragged me out the door by my leg if I’d tried. Loke the Bully, yodeled and stamped his feet in an impatient prance as I did my usual routine of getting settled. The we were off. He pulled during the first wild stretch. He almost always does. I avoided going through the back residential way with its bumpy, harder-to-pedal, surface to spare my knee somewhat. I spun along lightly as Loke charged forward, ears back with a husky smile. I expected him to settle once we passed the school, but he continued his wild sprint through the corridor of trees and the underpass. The short climb out of the underpass slowed us (me) naturally, but the furry one threw his weight into the harness so we ascended a little more quickly. Even once we reached level ground again, he continued to drag against the weight of the trike. With his determined assistance, I went by the turn for the shortest possible loop (2.5-ish miles). If he was going to be so helpful, I’d add what distance I could since I could go a little easier. From 2′ of snow to this! So quick! The skies darkened with thickening clouds and I felt a feather’s touch of droplets on my face. It wasn’t snow, but a semi-freezing fog. Branches of shrubs and trees looked slightly furry with frost though not nearly as breath-taking as the truly freezing fog in December. The miles continued with the subtle haze become more definitive. By the time we reached the out-n-back beside the river, the mist was thicker still, almost hiding the passing traffic on the 272 far across the nearly snowless fields. On the final stretch home, Loke briefly got to meet a wire haired fox terrier. The woman was walking the little fellow toward us as as I stopped not far from the yellow bridge to take a picture of the cathedral in the distance. The top half of the tallest double spires were lost in a line of low cloud . The terrier wasn’t aggressive at all, but desperate to come to us, his little paws running in place on the ice as his owner tried to get him to turn around. I snapped the shot (the photo came out very blurry thanks to low light conditions) and went slowly forward. Once I got closer, the woman asked if it was okay for the two dogs to meet. The terrier was still young enough at barely 1 year old to have the puppy spirit. He bounced around and tried to box with Loke. Loke responded with the same energy, but not too bossy for once. The little guy was absolutely fearless, as a terrier should be, and seemed equally people and dog focused though Loke seemed determined that all the attention should be his. He bounced in between me and the cutie every time he tried to come greet me. One could almost think Loke was being a tiny bit possessive of me and/or the trike. After about 3 minutes, we went on. With Loke’s boost, we actually did the full River Loop with all the extensions except for the Field Loop. I didn’t really feel like tackling two treacherously icy, unpaved stretches even if my knee had been painfree. The ride gave us another 7.88 miles. Despite my aversion to goals, I’m tempted to push for my January 2013 distance to be greater than the total of January and February 2012 (61.72 miles). I should be able to get another 27+ miles in 3 weeks. After all, look what I did this first week! Loke snuggling with part of his one true love. Loke made me smile and go ‘Awwww’ while I was getting the trike back into the apartment. Like always, I brought in Loke, various bags and seat in one go. Dropping it all on the livingroom floor after taking Loke off the leash, I rushed out for the main body of the trike. 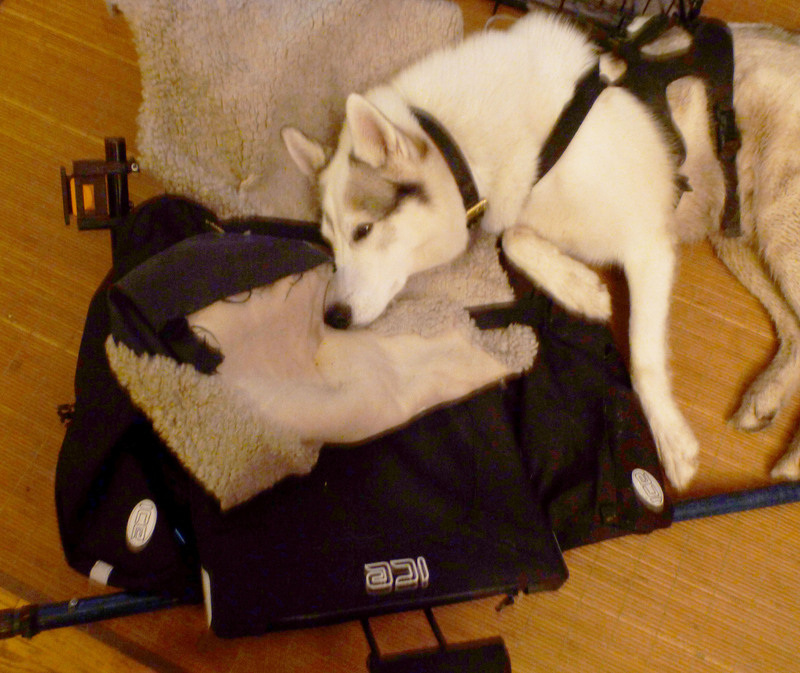 Upon staggering through the door, I found Loke cuddled up with the seat. I just had to put the trike down to dash for a camera. Loke accommodated me by not moving as I found it and got into a good position to capture the sugary cuteness. The ride turned out better than I planned and Loke was content with sleep and making me toss his squeaky toy for the rest of the day.